Sides can be daunting. Veggies can be… y’know. Green. And if that’s not your favorite color, then they’re a drag. As I’ve gotten older, grown up, I’ve developed an appreciation for certain veggies. I’ve actually come to LOVE some of them. Asparagus definitely fall in that very small percentile. I L.O.V.E.me some asparagus. A few months back I was watching a travel show, I think it was Samantha Brown in SF. She was showcasing a cooking school in town. 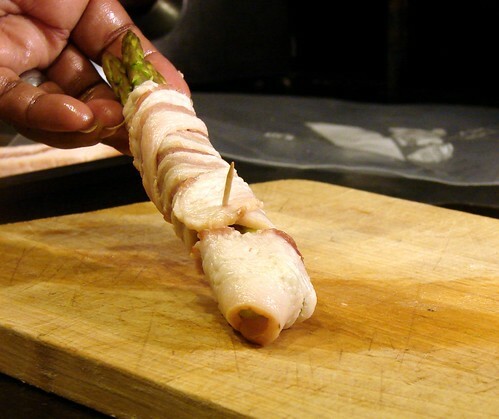 This was the first time I saw asparagus rolled in prosciutto. These days I see it almost every time someone is making asparagus. Nonetheless, I thought it was an awesome idea and couldn’t wait to give it a try. However, the more I thought about it, I felt the prosciutto may just dry out. That, in my book, is a serious offense against pork. Alas! Lightbulb moment. Sub prosciutto for bacon and thus it went. This is so ridiculously easy AND delicious you won’t be able to stop making it. And if you have picky eaters, who can say no to bacon? Seriously. 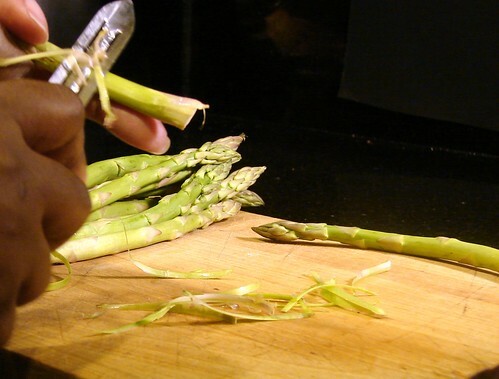 Trim and peel the asparagus: Bend the bottom inch or so of 1 spear, it will break where the tender part begins. Then use that spear as a guide to cut the other spears. To peel, use a potato peeler and peel about 1-1/2 inches from the bottom. This is not a necessity, but sometimes the peel can be a bit tougher than the flesh and you’ll end up with stringy asparagus. Rinse and pat dry. Set aside. 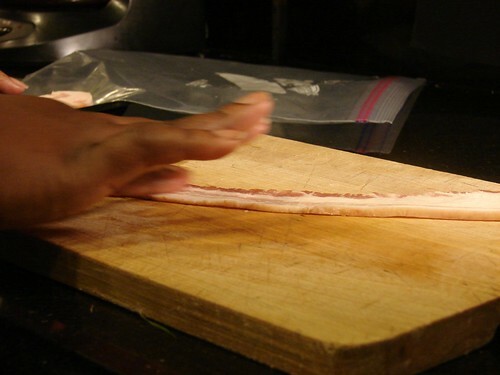 Place the bacon slices on a cutting board and thin it out a bit to make it more pliable. Divide the asparagus in 4’s. Tuck 4 spears together and lay them on top of a bacon slice. 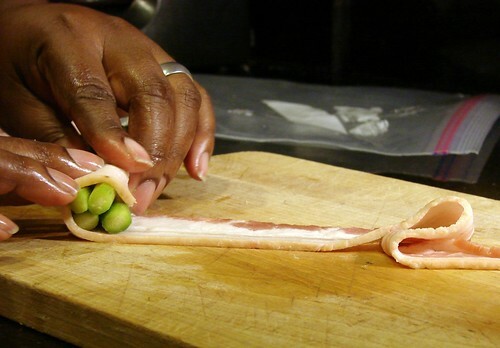 Wrap the bacon around the bottom of the asparagus, then continue rolling the bacon towards the top of the asparagus bundles. Hubby can tuck the bacon under to secure it… I must admit when he makes these, they’re way prettier than mine. I just use a toothpick and secure the bacon to the asparagus. Repeat this process for the other 3 bundles. Heat up a skillet–preferably non-stick–over medium high heat and place the bundles about 1-inch apart from each other. Sprinkle with fresh ground pepper. Brown the bacon on all sides, about 2 minutes per side. Remove from the skillet and set aside. Carefully remove the toothpick before serving. Hubby likes to slice them so they look like sushi. Beautiful, utterly beautiful. I love green. Green is good and bacon makes it bettah! 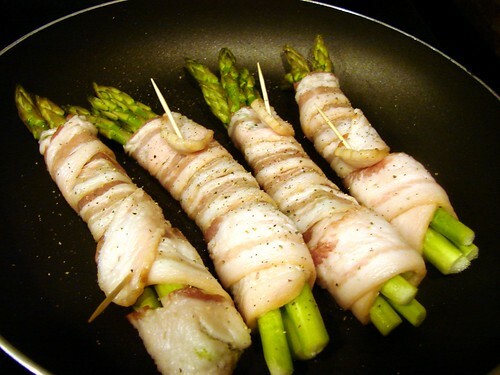 Now I love asparagus wrapped in prosciutto, but usually cook the asparagus first, then wrap it, then serve room temp. 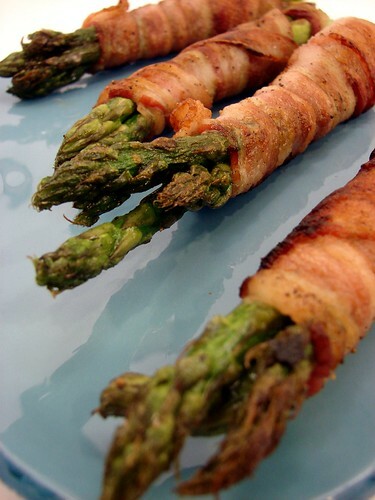 But the sight of your crispy bacon-wrapped and sauteed asparagus has me reeling. A great idea! @Arlene- That would make more sense! 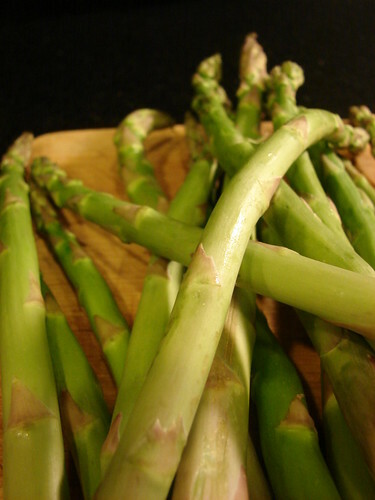 Cook the asparagus before warpping the prosciutto, that would preserve the delicate texture of it. I do hope you try this. Positevely addicting. 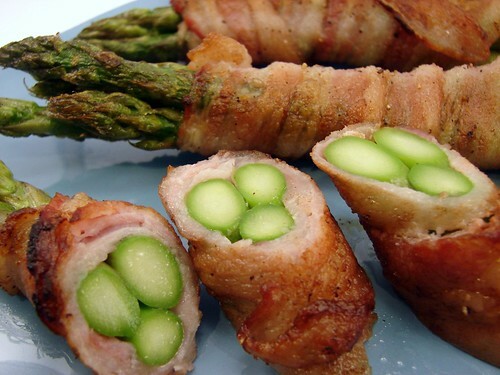 Oh my, bacon and asparagus - I love them both! This looks delish. I'm going to give it a try as soon as we have fresh local asparagus. Funny, I was just dreaming of asparagus this morning, soon, soon, it will be here! Bee, Ed, Polly--Always happy to meet new friends, I'll be checking you guys out. oooh, so fancy! I can taste it already by looking at it! thanks for sharing! that looks divine! How good would these be made half in size as hors d'œuvres at a dinner party? Thanks for posting them! I think they would be a hit. Cutting them to bite-size as they are in the front of the picture would make a perfect appeteaser! It looks in one word, delicious. Will definitely give it go!! I hope you do, they're as good as they look. Chef it yourself............. No body does it betta..Kinda feel sad forrr the rest.. Nobody does it,1/2 as good as U... Frenchie your the BESTTTTTTT!!!! WOO! Congrats on making the Top 9 on FoodBuzz! This looks amazing, and everything is better with bacon! Of course, that's one of the cooking commandments, no? Congratulations for making it to the 30 best recipes of 2010. A perfect appetizer that will make everyone go crazy. Happy holidays!